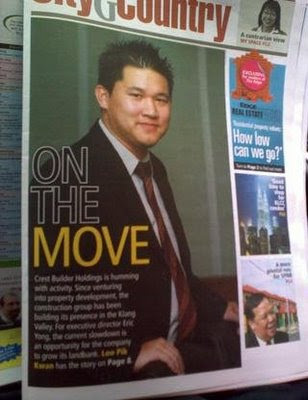 The Edge did a very comprehensive feature on Crest Builder in this week's edition of the weekly The Edge - with the main highlight being the recent acquisition of the 4.26 acre land in Damansara Perdana, the current property projects as well as an outlook onto the Group's Construction Division for 2009. Oh, and it had a mention of this BLOG too! This morning I had received numerous SMSes - telling me about the article. I was hanging around at one of my projects, The Twins in Pusat Bandar Damansara as we are still in the midst of a massive 2,600 m3 concrete pour for the transfer deck (it is a whole massive 48 hr casting - which started at Friday morning and will end towards Saturday midnight). I've decided that I'm probably not going to post up the article here. Probably not fair to The Edge for such a detailed and well done feature - so if you are interested to read the article, go get a copy of The Edge from your local newsagents. Anyways, I believe that this is the first of many more exciting happenings to come for the Group.